Alpine Ocean Seismic Survey, Inc., (Alpine) will conduct a geophysical subsea survey for Maine Aqua Ventus on November 10, weather permitting, between Port Clyde and the UMaine Deepwater Offshore Wind Test Site at Monhegan Island. MAV has been in contact with a variety of fishermen and other ocean users who may be impacted by this temporary survey. This letter is intended to provide information to Monhegan Residents. Alpine will be using the R/V Shearwater and the M/V William M survey vessels. A local lobsterman, who previously ran a watch on the R/V Shearwater, will be on the survey vessels as a fishermen’s representative. 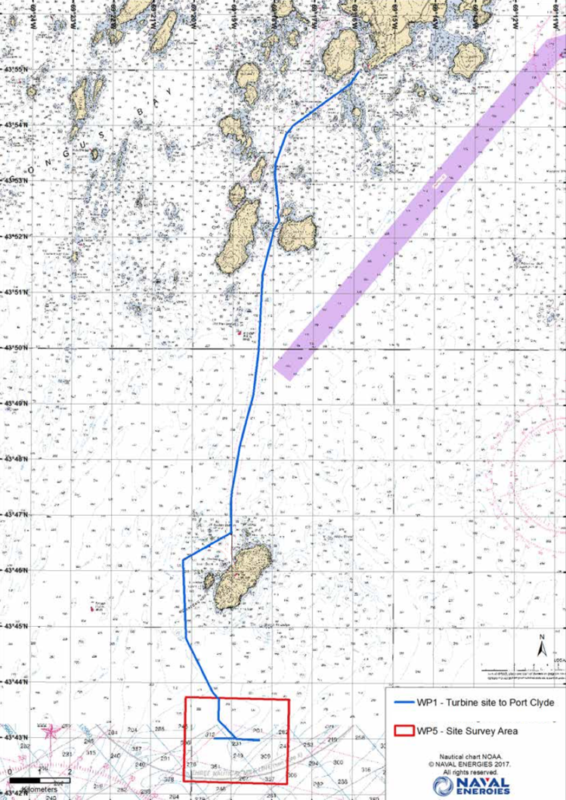 The survey path follows the existing Army Corps/NOAA charted cable way between Port Clyde and Monhegan Island, specifically chosen to minimize impact on fishermen and fishing activities. The survey includes a path from Monhegan Island to the UMaine Deepwater Offshore Wind Test Site and the test site itself which is located 2.3 miles (3.7km) south of Monhegan Island. In addition, Alpine will survey an area adjacent to the Mack Point Marine Terminal in Searsport. A chart of the survey line between Port Clyde and Monhegan is provided below. As you are well aware of the variable weather these dates may get pushed back.